Thanksgiving brought another round of waves to Ventura Point. The holiday weekend brought out the crowds too. Large, powerful Pacific swells create a current that sweeps through the pier, a hazard to the inexperienced surfer. According to the newspaper, lifeguards had 22 rescues over Thanksgiving, and even discussed 'closing' the point to surfing. Winter swells are formed by storms tracking across the Pacific Ocean, blowing gales over a long 'fetch' of open ocean. Whether or not we get rain is dependent on where these storms make landfall. 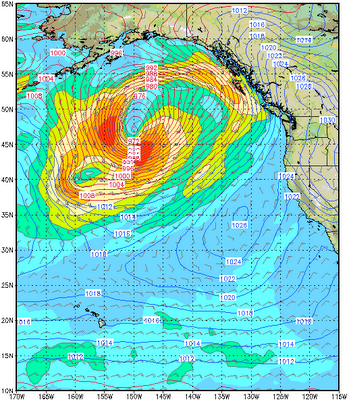 Often a high pressure off the west coast will turn the storms northward, with Portland/Seattle getting all the rain. This high pressure is common in 'La Nina' years. But 'moderate' may still result in a storm track that veers north as it approaches the coast. 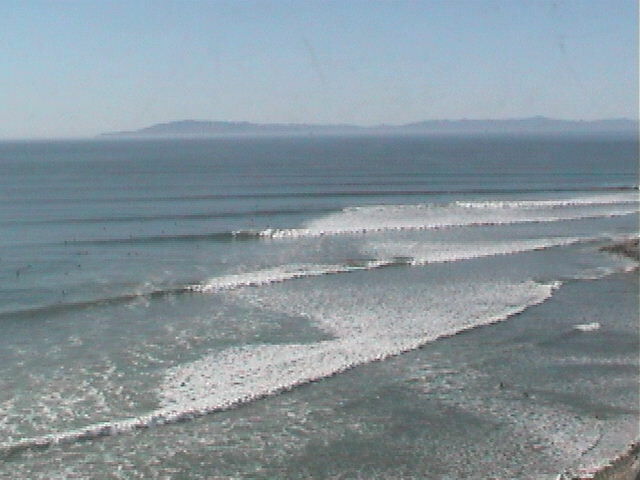 Good weather for surfing, perhaps not so good for farming. Or, if these early swells are any indication, we may see a repeat of 1998 which recorded some of the highest rainfall of the past century. 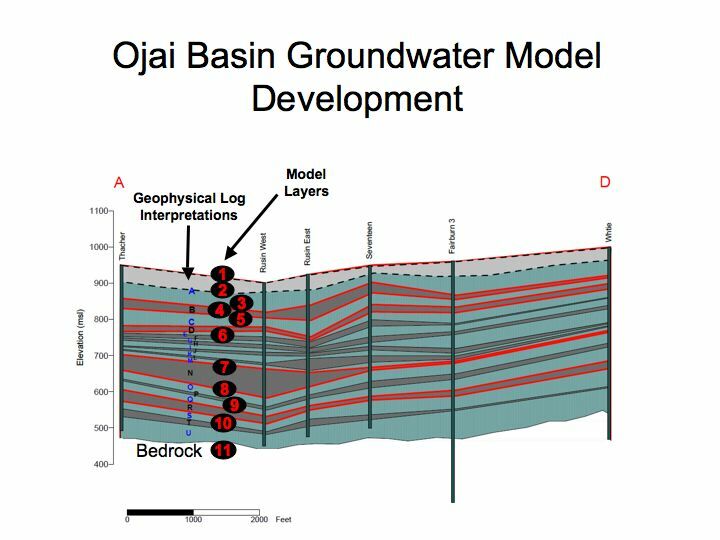 A recent article in the Ojai Valley News describes a study of the Ojai groundwater basin that recently gained funding from the State Dept of Water Resources (DWR.) 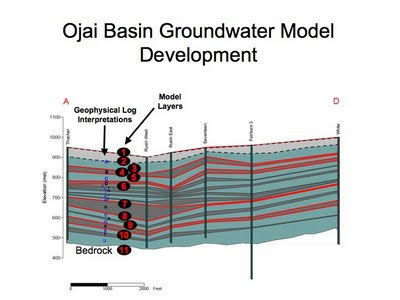 The $219,000 grant administered by the Ojai Basin Groundwater Management Agency (OBGMA) will help advance the understanding of how the Ojai groundwater basin works. The study will help plan for water management, especially under the drought conditions that create conflict in the valley. 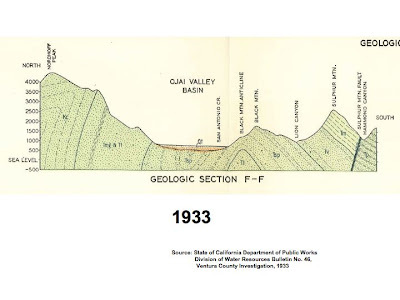 The project consultant gave an overview of the evolving understanding of the groundwater basin at the October meeting of the Ventura River Watershed Council. These graphics are courtesy of Jordan Kear. 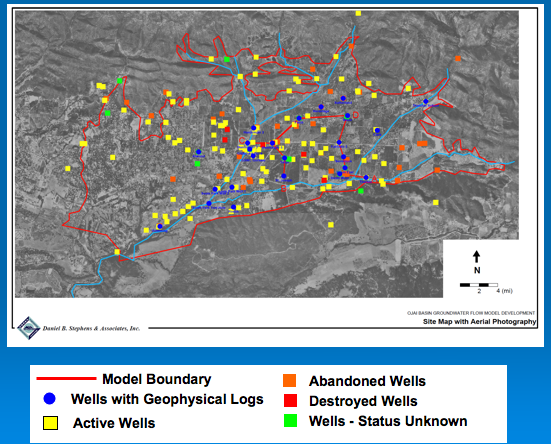 The Ojai valley relies upon groundwater for much of its water supply. Under natural conditions, rainfall soaks into the ground filling in spaces within the soil and rock. This groundwater reserve is called an aquifer. Over 200 wells extract water for agriculture, residential, and other uses such as the two golf courses in the valley. 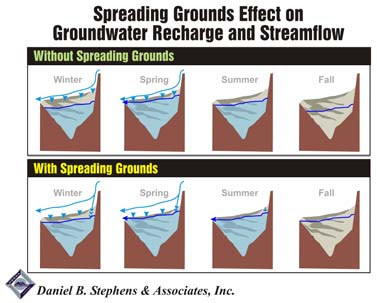 Since aquifers are often connected to surface water, wells can also reduce flows in nearby rivers and streams, which downstream uses rely upon. 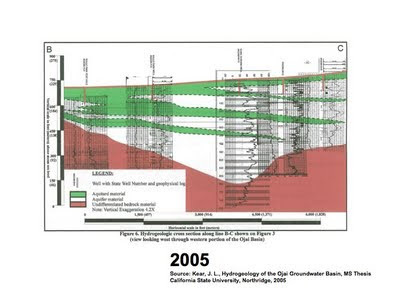 So groundwater management is also a critical piece of overall ecosystem-based management for the watershed. Folks in Ojai have been researching potential solutions to the manure problem. One big idea is creating marketable products from the waste, and in the process make a big step toward local sustainability. In this case, a BioDigester that would process collected manure and green waste into bioGas for use in vehicles or electricity generation. And the remaining solid waste would provide seed-free nutrients for local agriculture, further offsetting the use of petroleum-based fertilizers in the valley. This is not a cheap project, but a local bioGas generation plant could solve multiple social and economic problems - the 'triple bottom line' of "people, planet, profit"
Horses are a way of life in the Ojai Valley, but the waste they generate has long been recognized as a potential water quality problem. The issue is nutrient-rich manure that is often disposed of adjacent to or sometimes in the creeks throughout the watershed. This elevates nitrogen levels in the water, which leads to excess algae. See previous blog post here. A preliminary survey was recently conducted to evaluate the scale of the problem. The results were submitted in a memo to the Regional Water Quality Control Board who are currently considering regulatory approaches for the Algae TMDL. According to the memo, the study was based on information from horse owners, site visits to the main horse locations, and well known horse locations. Based on this survey, there were 62 horses counted within the City limits of Ojai. 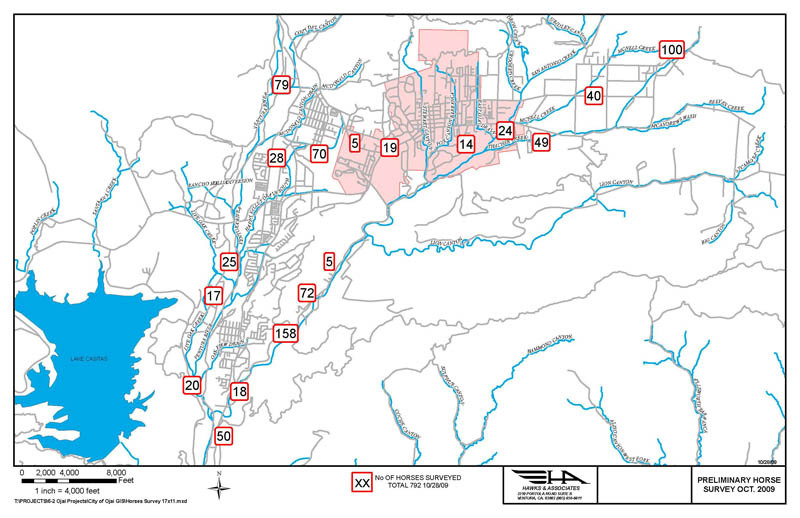 And valleywide, excluding the upper Ojai Valley, the numbers shown on this map total 792 horses. It is believed that considerably more horses could be located with a more detailed survey. A more detailed survey would take many field trips and review of aerial photography. The detailed survey should yield at least twice the number horses shown in this preliminary survey. Many of the horses that are not yet counted will likely be on locations with 1-5 horses. Funding for a detailed survey has yet to be obtained. At this time, the best estimate for total horses in the Ojai Valley (excluding the upper Ojai Valley) is 2000-3000 horses. If each horse has 30 lbs/day of solid waste*, that equates to 30-45 tons/day of horse manure. The 'spreading grounds' historically existed to recharge groundwater in the Ojai basin using water delivered through the Matilija Conduit from Matilija reservoir. This was the primary intent of Matilija Dam when constructed in 1948, but the practice was discontinued with the construction of Casitas reservoir in 1956. 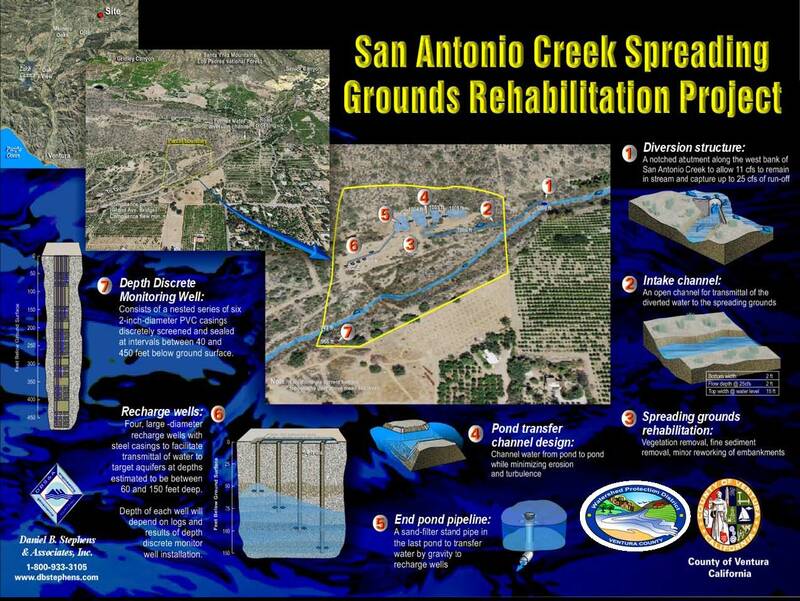 This project would rehabilitate the historic spreading grounds to enhance groundwater recharge using water diverted from upper San Antonio Creek below Senior Canyon. The project includes construction of recharge wells, as well as a monitoring well. 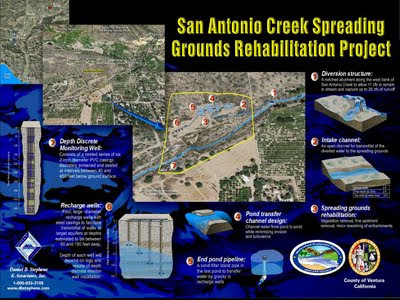 • Diversion of a portion of the precipitation that is typically lost from within the San Antonio Creek Sub-Watershed to the rehabbed spreading grounds using project facilities. 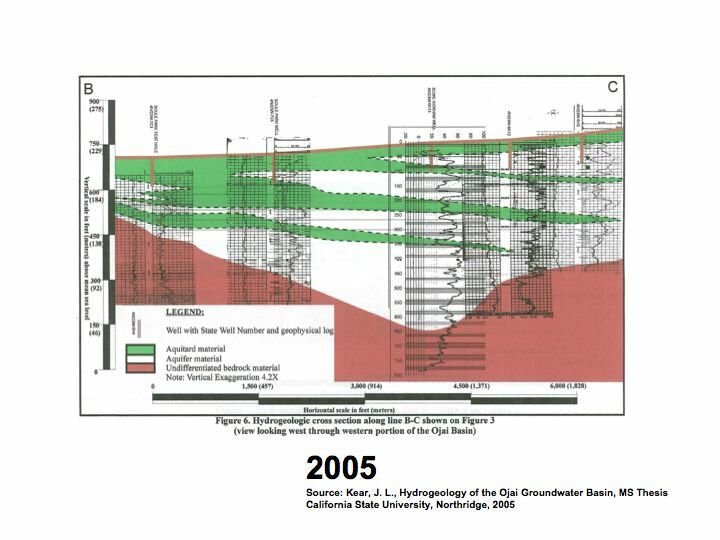 • Increase the groundwater recharge and storage in the Ojai Valley Groundwater Basin (OVGB), thereby enhancing the reliability of production from local water supply wells. 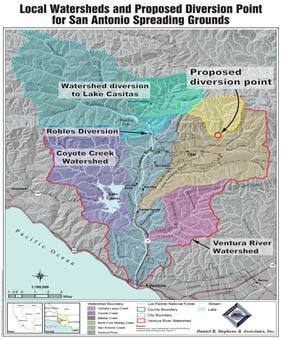 A stakeholder group inclusive of the Ojai Basin Groundwater Management Agency, the Ojai Water Conservation District, the Golden State Water Company, the Casitas Municipal Water District, and the Ventura County Watershed Protection District is working cooperatively to complete this groundwater recharge and supply project. The $1.4 Million project is funded by the combination of a $1.3 Million Prop 50 Implementation Grant from the State of California and approximately $100,000 in local match contributions from the five stakeholders. 1: Concerns with water supply were justified by a 'tolling agreement' between the City and Fox Canyon Groundwater Management Agency and United Water Conservation District. The tolling agreement would postone any legal action against the city until July 1, 2010, giving time to test the well in question to determine if it would in fact affect groundwater supplies as the water agencies suggest. 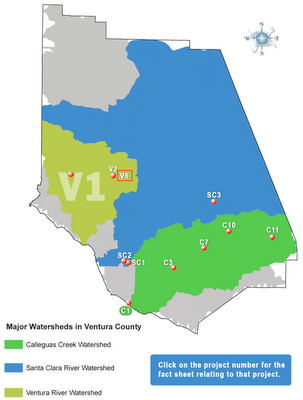 2: Flooding concerns were answered in a last-minute e-mail from Ventura County Watershed Protection District. 3. As highlighted by Councilmember Morehouse, this plan was completed after 3 major developments in the planning area have already been approved. The figures shown here were submitted as comments on the EIR from the East Ventura Community Council. 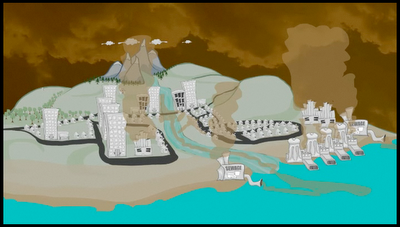 They illustrate the variability in the City's water supply, and vulnerability to drought. 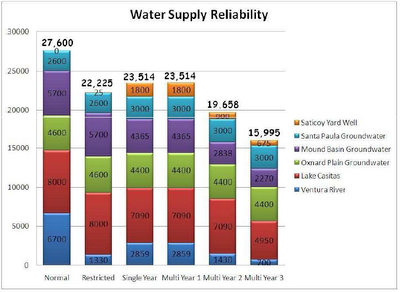 Note that the Ventura River/Casitas supply makes up a significant portion. 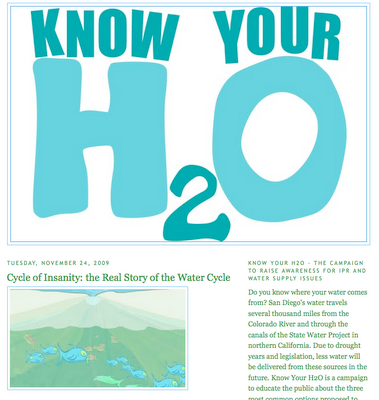 The City's water supply as outlined in the General Plan and used in this EIR is based upon wet years. A drought as short as 3 years may limit supply to as little as 60% of normal. This is what adjacent water managers mean when they write that, "We believe as described above the City's assumptions and estimates for future water supplies may be over estimated." And as predictably as the City outgrows its water supply, our rivers will surely get drier. City Council meeting agenda, minutes, and video for Nov 16, 2009 are online here. Ventura County Parks Department is planning to construct a bridge at the confluence of San Antonio Creek and the Ventura River. Funding would come from state and federal salmonid restoration grants. 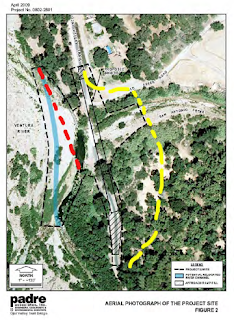 This project will enhance the bike trail as well as improve fish passage up San Antonio Creek. The project consists of the replacement of the Ojai Valley Trail culvert crossing with a bridge at San Antonio Creek, including removal of the existing culverts and associated fill, construction of the bridge and site restoration. Based on conceptual plans developed to date, the bridge would have an overall length of 790 feet, including approach ramps. The bridge span would be approximately 510 feet. The bridge deck elevation would be at about 323 feet, about 10 to 12 feet higher than the existing trail surface elevation. 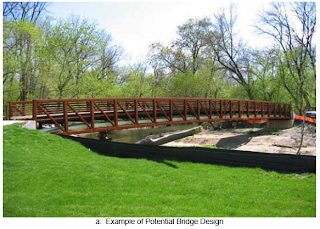 The bridge would be designed to support pedestrians and bicycles, and occasional light-weight patrol vehicles (golf cart-sized). The bridge approach ramp grade would be 5 percent or less to meet Americans with Disabilities Act requirements. A Public Hearing will be held Nov 24, 2009 at 10:30 am at the County Board of Supervisors. Over 20 volunteers came out on Saturday for the kickoff of a well-planned collaboration to restore a section of the Ojai Creek. On the first three Saturdays of this month, the riparian corridor that meanders through Libbey Park will be restored and enhanced through removal of invasive non-native plants. The project will improve the creek’s flow and reestablish a functioning wetland and riverbank ecosystem to support a diversity of fish and wildlife species. The Ojai Creek Restoration Project is a collaboration of the Ojai Valley Green Coalition under the leadership of conservation biologist and Watershed Committee Chair Brian Holly, and of representatives from the C.R.E.W, the Ojai Valley Land Conservancy, BioResource Consultants, Inc., and Glenn Hawks and Associates, along with numerous other volunteers. Members of the community are invited to participate on any or all of three consecutive Saturdays starting on November 7 - 9:30 a.m. at the Libbey Park Gazebo. Sunday November 8 - Around 400 runners and walkers turned out for the annual 'Fun Run' event sponsored and organized by our good friends at Patagonia. This year's proceeds benefit the Matilija Coalition, a program started in 2000 by the Ventura County Chapter of the Surfrider Foundation to focus attention on the removal of Matilija Dam. 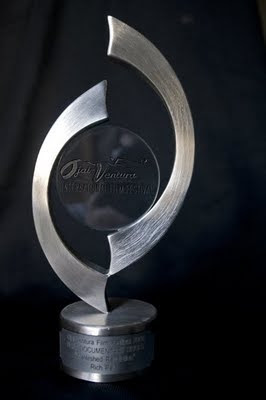 'Watershed Revolution' won 'Best Short Documentary' in the Ojai-Ventura International Film Festival this weekend. Apart from the fact that it was great to see our film played in a real theater, Watershed Revolution also received a great response from attendees of the film festival. Each showing was followed by audience question and answer. 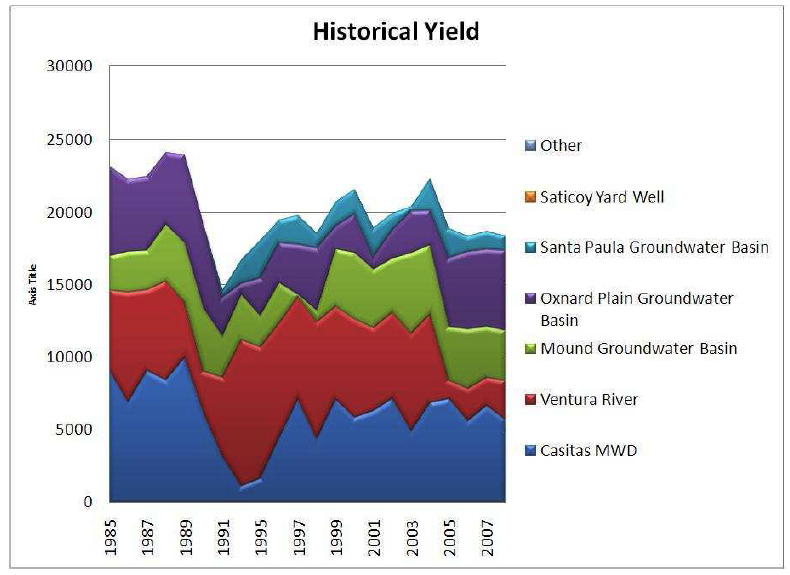 The number one question - "When will Matilija Dam come down?" 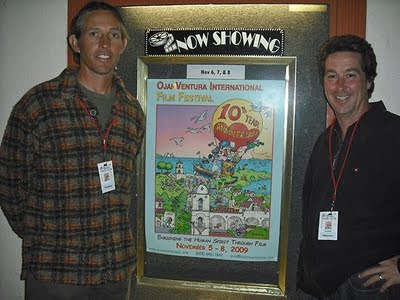 photo: Co-Producers Rich Reid and Paul Jenkin at the Ojai Theater after Sunday night's showing. Watershed Revolution will be featured in the Ojai – Ventura International Film Festival this weekend. Individual tickets are $10 and can be purchased at the door, and you can purchase a 4 or 6 pack of tickets online. Watershed Revolution is a locally produced film that asks the question, “What is a watershed?” The answer is explored through interviews with people working to protect and preserve the Ventura River, while stunning high definition cinematography brings to life the beauty of the river. The 30-minute film profiles community members and organizations working to protect and restore our watershed. It highlights the need for open space and floodplain protection, sustainable agriculture, and community awareness of our most precious resource: water. 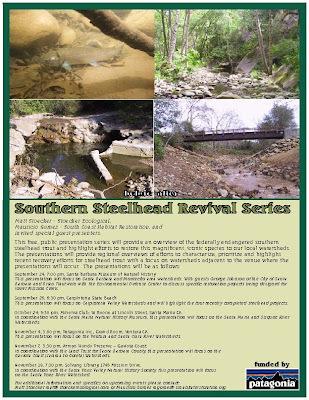 Over 120 people attended the Steelhead Revival presentation yesterday at Patagonia headquarters in Ventura. The event was organized by Matt Stoecker and Mauricio Gomez to provide an overview of the federally endangered southern steelhead trout and highlight efforts to restore this magnificent, iconic species to our local watersheds. This event, fourth in a series, focused on the Santa Clara and Ventura River watersheds, both of which drain to the ocean in the city of Ventura. Matt provided a lively overview of the species, a presentation filled with photos and video that brought the fish to life. Matt also highlighted some of the recent progress made in our region with removal of small barriers that have reopened upstream habitat critical to the recovery of this endangered species. I was invited to provide an update on the work of the Matilija Coalition, a program that has benefited from the support of Patagonia since 2000. I gave a brief overview of Matilija Dam and the steelhead monitoring that we have been sponsoring for the past 2 years. In coordination with the Land Trust for Santa Barbara County, this presentation will focus on theGaviota Coast (Jalama to Goleta) Watersheds. on the Santa Ynez River Watershed. 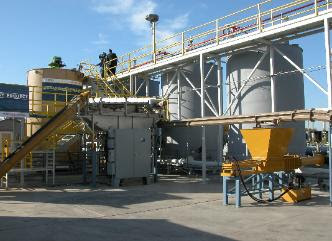 Matt Stoecker matt@stoeckerecological.com or Mauricio Gomez mgomez@schabitatrestoration.org. Many thanks to Patagonia for making this series of events possible.